It was an app that provided access to all of the UK's main TV channels in one place, now users are being offloaded to the iPlayer. 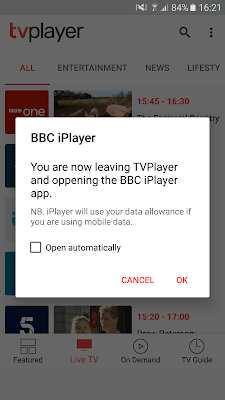 The TVPlayer app on mobile and tablet platforms has begun to redirect users wanting to watch the main BBC channels to the iPlayer app (pictured above / screenshot from the Android version of the app - with spelling mistake). After readers to the site flagged up the change, which is believed to have taken place last month, a516digital investigated. Currently, a sample of TVPlayer mobile and tablet apps are only streaming the BBC Red Button service (simulcast of what's available on Freeview channel 601). 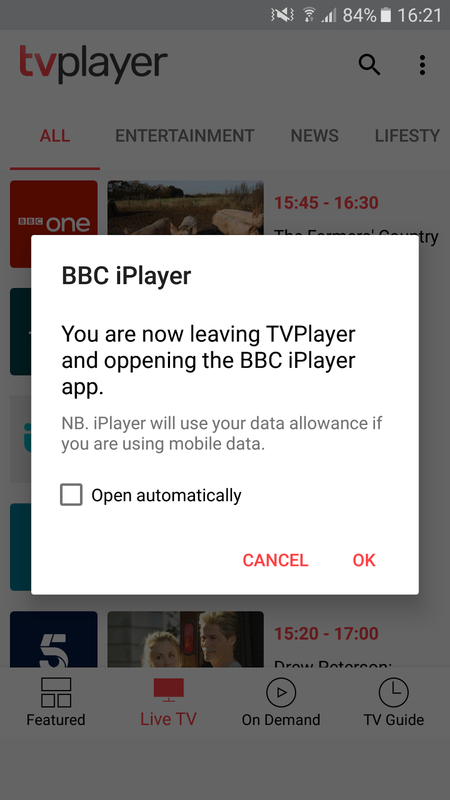 All other BBC channels trigger a request to open the iPlayer app, meaning the TVPlayer app no longer directly offers streams of all the main channels. Users of the main web version of TVPlayer at TVPlayer.com, including those accessing the site via mobile devices, can still access all BBC channels within the TVPlayer interface. Further changes to the free-to-view streams includes mandatory registration to watch the ITV and Channel 4 and their offshoots for users who don't subscribe to any of the optional TVPlayer subscription packages. This follows increased moves by broadcasters last year to get users to register to watch content online. TVPlayer is the effectively the UK's main independent broadcaster-approved streaming service, and has over the past four years since we started covering the development of the service, struck numerous official carriage deals with broadcasters, unlike many other TV streaming apps, some of which have found themselves in legal hot water. TVPlayer points to licensing restrictions attached by rights holders that affect which channels they can offer on each platform. This article follows reader feedback. Help us to gain a fuller picture across the myriad of devices that support TVPlayer by tweeting @a516digital or visiting facebook.com/a516digital. Please note that TVPlayer on TV platforms such as Freesat already exclude the main channels, as they are available on the TV platform. Here the TVPlayer generally offers complementary channels.